Innovators These brave souls take on new technologies, trial them, then will often evangelize them. I’d put those that adopted Twitter in 2006. or any entrepreneurs that creates new technologies fitting into these categories. From a corporate perspective, Dell was forced into this arena, and has benefited. Glory for being first, a thought and practice leader.. Will have learned from their mistakes, and have far more experience than any others. Will always be able to tout they were first. Very costly in terms of time, effort to find new technologies that are often flawed. Additionally, since innovation becomes cheaper and more accessible, this becomes more difficult as more entrants to the market launch products. Lastly, while these folks may be first for some technologies, they are often wrong for the many other technologies that did not take off. Early Adopters This behavior is exhibited by those that try out new technologies in a careful way, often thought leaders. 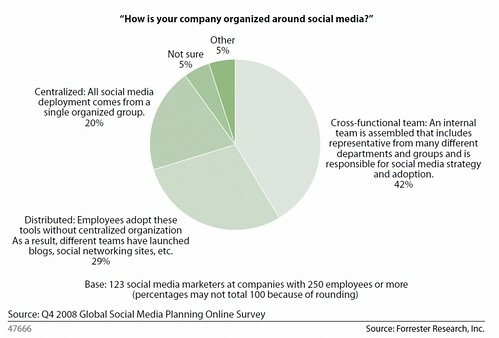 Some analyst firms like Forrester adopted early, and the Tech industry deployed social. Agencies like Edelman, Razorfish have helped their clients. Learn from the failures of innovators, they reduce risk. Often they have the opportunity to explain how it works to others. Become the case studies that other groups follow Never first, and have to write the playbooks. They may adopt, but at higher costs than the majorities as the technology has not matured. Tech companies adopted social in 2005-2007 as an early industry, but a lack of measurement, and rapid tool change required great effort to stay current. Early Majority Although thoughtful in their deployment, they adopt faster than the mainstream. in 2009, we saw industries like consumer packaged goods, finance, and healthcare adopt social technologies. I think of when mainstream Oprah joining Twitter as a defining moment as she was ahead of most celebrities and media. Technology starts to mature, reducing risk and costs. Standards emerge, although this group gets to help define mainstream adoption. Some of the cool factor leaves, and brands start to move in on social technologies, scaring off some innovators. Laggards Still cautions in deployment, even after the technology has become mainstream. These folks will adopt social technologies in 2010 or later. Cookie cutter deployment from standardization and very little risk. Deployment may actually be faster and with less effort than those above. In balance with lower risk, lower opportunity for reward. No thought leadership, and little additional reputation or buzz value from the intended investment. Examine your organizations adoption patterns. First, define how quickly your organization responds and adopts to technologies, and factor into your considerations. Be a Category Ahead Of Your Company. If you’re responsible for new technologies at your company, your personal adoption should be a level or two ahead of the organizations adoption, as you cannot effectively deploy for your company if you don’t personally understand the impacts of the new technologies. Track The Category Ahead Of You. Find an individual that’s above your adoption category (the early adopter watches the innovator) and be sure to watch their behaviors and learn from them. Adopters are often blazing their own trail, and may not ever follow anyone. Let’s learn from each other, I’d like to know about your adoption behavior and that of your company. Were you deliberate in choosing your adoption strategy? How does it hurt or help your company? 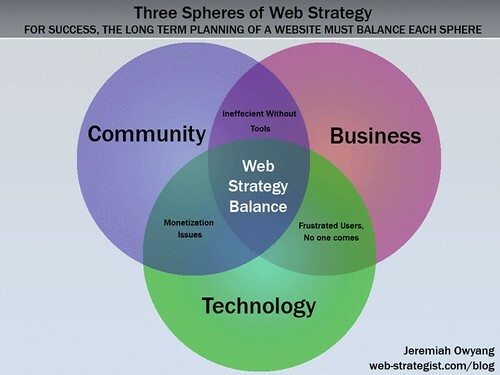 The nearly mainstream social web is now evolving and graduating to mobile devices. This emerging space of mobile-based social networks are empowering customers to find the best venues and prices, and offering savvy companies unique ways to cater to this new medium. Yet, despite the emergence of applications like FourSquare, Yelp, and recently launched GoWalla, there are risks as customers talk directly to each other and opportunities for businesses who harness the tools. Local businesses should approach the mobile social networking space by first listening to their customers, responding to commenters, provide special offers to advocates, and prepare for pricing to be impacted. 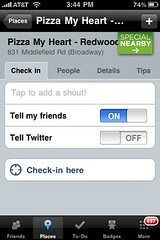 Using FourSquare, a location based social network, I ‘checked in’ to the movie theatre indicator to my friends my location. Immediately after the application identified my approximate location it offered a ‘special nearby’ which I clicked. 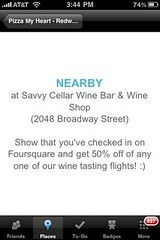 The Savvy Cellar Wine Bar offered me 50% off a wine flight to a store 2 blocks away. Using both my general location using 3GS on the iPhone and my explicit checkin to the location, it was able to serve up advertisements based on my physical location. We should expect FourSquare to evolve and eventually offer advertisements based on your friends interests “John, Amy, and Allen all like Los Taqaritors, invite them now for a 20% off discount”. Location based ads will soon connect with social information. The opportunities aren’t just focused on location based, but also provide opportunity for developing an unpaid army of advocates. Take for example Foursquare’s point system, those who ‘check in’ the most to a location can become the ‘mayor’ of their particular store, indicating they’re the top customer. Some savvy restaurants provide free drinks or other services to the mayor, who will continue to spread their affinity for a restaurant using social networks. A few weeks ago, I spent time with Yelp’s marketing team and their community manager Connie who oversees many of the community facing events. I learned that many local restaurants cater to Yelp Elite, and will likely provide them with quality service above and beyond, in fact, Yelp has launched a program for restaurants to offer a prix fixe menus for Yelp users. Expect to see Yelp’s mobile application advertise these special deals for Yelpers as they search for restaurants online using mobile devices. Despite the innovation, location based marketing and advertising has its limitations as it’s dependent on: total number of consumers with mobile devices, adoption of mobile social networks, and their desire to find location-based offers. Listening In For Free Research. Local businesses should immediatly montior their brands on mobile social networks like Yelp and FourSquare. Use this information as free research: find out the perception of customers opinions both good –and bad to learn about their market. Responding To Reviewers. Use negative information as a way to improve products and services and let your community know you’re listening to their feedback. Although there are always two-sides to any complaint use these same tools to respond to customers in public, but be sure to abide by the terms of service. Rewarding Top Customers. Customers that frequently patron your store and tell others on these mobile social networks should be rewarded. Build both in person and online relationships with them so they’ll continue to advertise and market on your behalf. Free drinks anyone? Preparing for pricing impacts and positioning. With disruptive tools like RedLaser appearing, customers can quickly find pricing of products and find them at nearby retailers. Retailers like CVS, Walmart, Target, BestBuy, Safeway should take heed as consumers continue to become empowered through instant information. Companies will need to respond by: making product pricing more competitive, or offering other deals such as bundling, speed, time, or other value-based offerings. Update: Here’s some screenshots, I learned how to take screenshots with your iPhone by holding the main button and power button.